Australian legend Shane Warne has named his ideal Australian Ashes XI, and it isn’t quite as chock-full of bolters as we’d have expected. While he has predictably put a couple of curveballs in the squad, Warne has seven members of the team who won the second Test against Sri Lanka in comprehensive fashion at Manuka Oval. He’s also managed to avoid selecting D’Arcy Short, which will no doubt come as a surprise to many. The biggest change in Warne’s team is the dropping of Usman Khawaja. The first drop had a poor summer with just one score over 50 against India and a century against Sri Lanka when Australia were already ahead of the game. Still, it would be a huge call from the selectors to drop the experienced number three. Warne has indirectly replaced him with David Warner, who would open, pushing Marcus Harris to number three. In a call that will surprise absolutely no one, Warne also wants Marcus Stoinis to play, batting at six instead of Kurtis Patterson, while former captain Steve Smith also features in Warne’s XI ahead of Marnus Labuschagne. The former leg-spinner, who finished his career with more than 700 wickets and made a habit of tormenting England, has also recalled the injured Josh Hazlewood in his XI, but not for his debutant replacement Jhye Richardson. You’ll all be shocked to hear Warney would drop Mitchell Starc from the side, despite the left-armer looking back to his best in the last Test against Sri Lanka, a match in which he claimed ten wickets across both innings. Pat Cummins and Nathan Lyon would round out the attack. 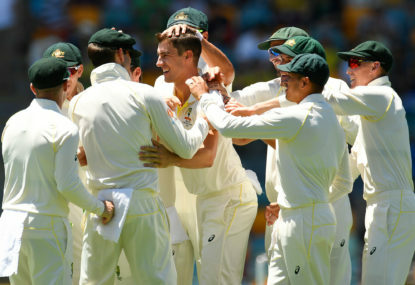 Australia have a World Cup and ‘A’ tour of England to complete before the Ashes, which should give the selectors some good form to go off in English conditions before the biggest Test series on the cricket calendar gets underway.